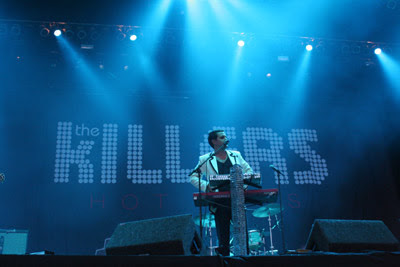 So, about 3 months ago, I was offered free tics to go see the Killers. I remember exactly when it was b/c it was the night before we drove down to C-bus for my sister’s commencement ceremony at OSU. I felt guilty about accepting the free tics, b/c I felt that I didn’t work for them or earn them in any way. Does that make sense? So, anyway, they were in town Friday night, & Mr. T got to hang out with them for afterhours. They were down where Mr. T works after they finished up their show at the Wolstein Center to chill & hang out. I normally go & hang out w/ Mr. T on Fridays, but this Friday, I was just too exhausted to do so. (I’d only gotten 2 hours of sleep the night before). It’s cool though, I mean what’s meant to be will be, right? I guess it just wasn’t meant for me to see any killers this year. If I know anything, it’s that they will kill again.